There are many possibilities why you might be interrupted in your current task and have to work on something completely different - for example when you are working on your current coding assignment for a new feature and realize that you have to fix a bug in a related system before proceeding, or when you are suddenly interrupted by a customer call. Sometimes you don't even know with which project or task a new interruption might be related to. This is what we call your work stack. 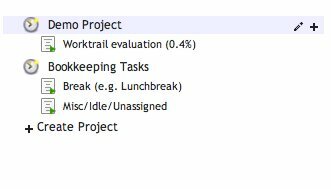 All your tasks you have been actively working with are kept open as tabs, if you need to work on another task you simply open a new tab - this is all you have to worry about in worktrail. Once you are done with your interruption you can document it, assign it a task and close it. Worktrail will automatically switch back to the last open work. When you switch to a new task your current work is paused and time is counted on the new task. You can switch back and forth between each work, but if you keep one open for more than a minute a new work entry is created for the active task. The most efficient time tracking is the one which features the mots granular categorization of your work. So if you choose to work on a new task it is essential that it is easy to create a new task and assign your work to this task. In WorkTrail you simply open a new tab, do you work and take notes while you are at it. Once you are done (or any time before that) you assign it to a task. If you fitting tasks currently exist you can simply click on the + button in the tree and create a new one. Sometimes you don't want to spend the time thinking about which task to assign for a given work or don't want to track your time while working because it just gets in your way or when you simply forgot it. This makes it extremely important to have easy and fast way to change your past work entries. WorkTrail uses a familiar calendar interface - Simply click in the calendar and drag to create a new work entry. Afterwards assign it a new task by dragging from the task tree onto your work. Colors will show you which work relates to which task, giving you a nice overview on which tasks you have worked on for that particular day. 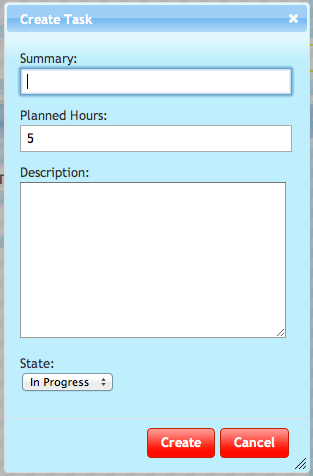 You can also add or modify the work summary by just clicking into the work entry. In the management interface you can see statistics of all your employees and projects, see their latest work entries or export them into a spreadsheet using CSV. This all can be grouped by project, employee and/or year, month and week.